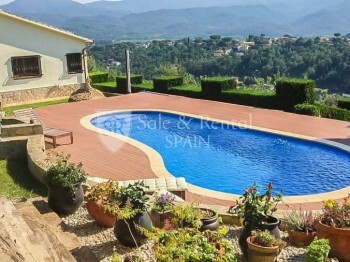 *Excellent house with beautiful views of Montseny and Montnegre. The house has been renovated in 2016 and has a total of approximately 211 m2 and a plot of about 3800 m2 fenced. It has a total of 4 bedrooms and 3 bathrooms, one of them with bathroom en suite and dressing room. It has a beautiful living room with fireplace, a cast iron stove and access to a lovely terrace with barbecue area. It has a beautiful kitchen, with a beautiful central island of American oak. From the kitchen there is access to a pantry, with laundry area and a cellar, as well as an access to a terrace, ideal to be able to eat outside on sunny days. The house has a fantastic outdoor space with several terraces that overlook the pool and Montnegre and a nice garden. The pool is saltwater and is on a terrace of 100m2, with solar shower. It also has a garage for two cars with a full bathroom with shower. This house has been reformed with very good qualities and has heating, parquet floors, security doors and rain channels that collects water for the system of automatic irrigation of the garden. Located 5 minutes by car from the town center, its services and schools, well connected just 25 minutes from Girona and 50 minutes from Barcelona. Come and visit it, it's a dream house!